Belize travel article... about us! Belize travel article… about us! We just love our guests. They are always sending us amazing photos and recipes after they get home from our island in Belize. Yesterday my email box held a wonderful surprise from a recently returned guest… a feature length Belize travel article by Karen Lippold, which she has submitted to the Washington Post! Her title: “Belize: ATOLLtally Awesome Vacation”. Pending publication, Karen has graciously allowed us to quote an excerpt from her article. Karen joined us on our Adventure Island trip last December, and wrote extensively about her family’s vacation in Belize. “Our cabanas were exactly as described in Slickrock’s literature: thatch-roofed and perched right on the shore, furnished with just a hammock, double bed, mirror and solar-powered light. No mosquito netting was required as the constant breeze keeps the bugs away. Our sixteen-year-old son and 15-year-old daughter bunked together in their own cabana, six huts down from ours. They had one of the larger models with two rooms and a porch. Waking with the sunrise, or the patter of a morning shower on the thatched roof beats the blare of an alarm clock. And walking on the cool sand, navigating around cocopalms to the wash areas, certainly beats walking on cool bathroom tile. We completed our snorkel orientation the afternoon of our arrival. In addition to over 700 patch reefs near the island, guests snorkel on the reef wall just off shore. Unless you have snorkeled Glover’s Reef before, nothing will prepare you its technicolor underworld. We were told we would see over a hundred species of fish within minutes of jumping into the water and that was an understatement. Amid the kaleidoscope of tropical reef fish and the occasional ray were spectacular coral specimens: giant brain coral, sea fans, and staghorn coral among them. Because snorkeling can be done in rain or shine – in calm or choppy waters – I went snorkeling at least once a day and each trip was unique. Fifty feet off shore is Long Caye’s “Wall” – the edge of the continental shelf where the sea floor drops from 40 to 3,000 feet. One second you are looking for rays in the shallow, sandy depths below and the next it’s as though a blue curtain was pulled over the sea floor. On one of our snorkel trips our guide, Louis, speared a much-hated lionfish and fed it to a nearby octopus. The predatory and venomous lionfish (indigenous to the Indian and Pacific oceans) has recently invaded the Caribbean potentially devastating the delicate ecological balance of its coral reefs. Belize’s secret weapon for controlling lionfish populations are local fishermen. The Belizean Fisheries Department has approved of a “trident” that expert divers can use to harvest the fish. Snorkeling back to the island single file through a channel of coral we spotted a gigantic lionfish off to one side watching us paddle by. Of all the sports offered at Slickrock the one of most interest to my husband was windsurfing. He learned how to windsurf in Madison, Wisconsin, but had barely touched a board in 20 years. Our kids had never windsurfed and practiced on Slickrock’s land trainer during orientation before hitting the seas. 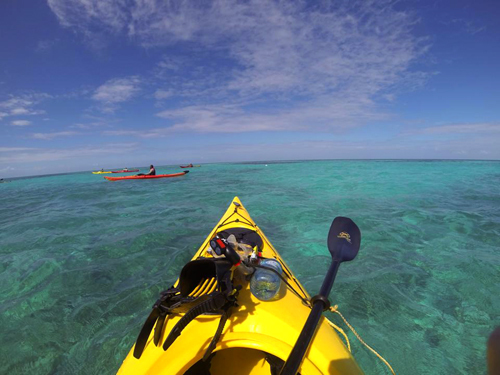 The calm waters inside the lagoon are perfect for beginner sailors while veterans are free to explore the atoll and neighboring islands – or even try the surf break! We enjoyed watching people take kitesurfing lessons on the shallow sand flats between Long Caye and Northeast Caye. Slickrock recently opened a professional kitesurfing school in association with Vela Windsports. The kitsurfing instructor doubled as a yoga instructor, offering classes at dusk. Meal times, to be expected, were always much anticipated. Slickrock’s cooks, Aurora and Marcie, did a phenomenal job of preparing three meals a day to ravenous guests. Cully, founder and owner of Slickrock, mingled with us during meals as did the Slickrock guides. There was never a shortage of food and menus featured traditional Belizean dishes and fresh ingredients. For example, all coconut dishes used coconut picked that day on the island. Flying home we started plotting our return. This first trip to the “jewel” of Belize was but a tease. There are hundreds of miles of caves to explore, coral reefs to swim, atolls to discover, and ancient Mayan sites to uncover – not to mention sports to conquer on Slickrock’s Adventure Island. We will be back!